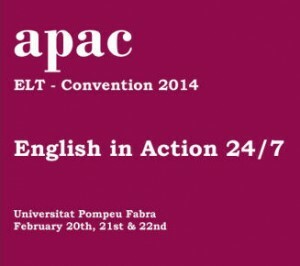 One more year, the SpeakApps project is participating at the Catalan Association of English Teachers (APAC) ELT annual convention. Celebrated at the Universitat Pompeu Fabra, in Barcelona, the meeting is taking place from 20th to 22nd of February and gathers together the regional community of English teachers. The APAC meeting motto for this year is English in action 21/7. Born in 1986, APAC is an organization open to all teaching professionals of whatever sphere or level that offers several support services —magazine, forums, social networks, etc.— to all its members. Come to the workshop by the UOC team with the title 24/7 Speaking Resources on Saturday 22nd of February and hear about the speaking tasks in the SpeakApps OER. We have uploaded the power point slides to SlideShare and EFL group space on this platform. Register here and join the discussion! If you are interested in learning more about the SpeakApps tools and activities, we will be soon announcing the starting date in March for the SpeakApps online training course.